CHICAGO—In an announcement perceived as a major reassurance to parents of children with low cognitive abilities, subpar reasoning skills, or who are simply “not all there,” top national pediatric health experts released a report Monday which claims that full-contact football poses little risk to children whose brains already don’t work too well. “Tackle football has long been known to be a high-risk sport, particularly for children under 12, but face it—some of these poor little guys are real knuckle-draggers, so why take away their fun? I mean, what do they have to lose?” said University of Chicago childhood development expert Dr. Maureen Clifford, whose neuropathological research led her to the conclusion that the risk of chronic traumatic encephalopathy caused by repeated or severe head impacts in children is mitigated by more than 90 percent in cases where the youth presented signs of being a huge dumbass and clearly had a couple screws loose already. 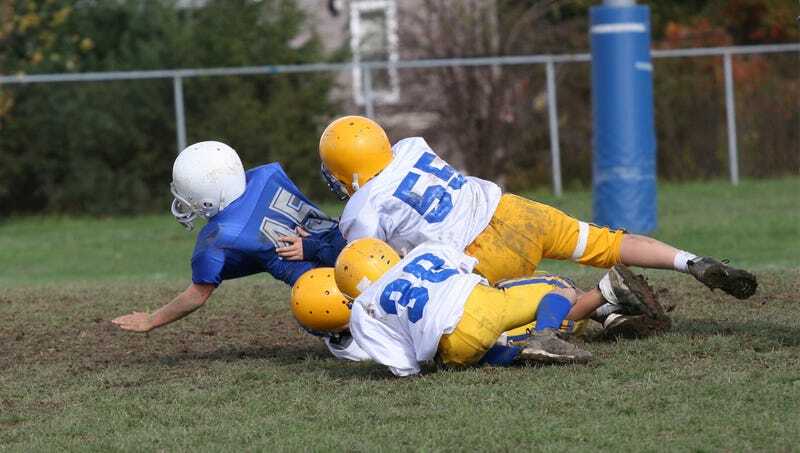 “Of course, CTE is the most significant danger when it comes to contact sports like football, and the ages 10 to 18 are especially crucial to healthy neurological growth. But what are the symptoms of CTE? Mood swings, difficult thinking, memory loss? If that sounds like your kid, it’s because your precious little dude is already kind of a bonehead. Blocking, tackling, and getting hit on crossing routes are the least of the reasons why they’re acting like such a goddamn idiot all the time.” The study concluded that, for many of these halfwits, football is in fact their only shot at success.